ASAP – the one stop shop with a comprehensive range of over 14,000 marine equipment and boat parts. Perfect for if you’re fitting out, upgrading a system, need spares or just general maintenance items for your boat. Worldwide delivery, same day despatch, local delivery and order and collection service available at both their Beccles and Fareham branches. Visit www.asap-supples.com or call the team today on 01502 716993. At Aintree Boats, our primary purpose is to provide our much valued clients with hand crafted, high quality, high value boats which they will be both proud of and delighted to own. Our directors have scoured the market and have carefully chosen the best suppliers, not just on price but also on reputation and reliability. We firmly believe that good quality suppliers are an integral part of any successful company. We have a reliable team of highly skilled tradesmen with over 100 years of boat building experience between them. This reliable workforce of welders, joiners and painters ensures the highest possible quality in our build process. Beta Marine Limited has built its renowned reputation on over 30 years of customer centred focus, listening to their individual maritime diesel power or propulsion needs, then delivering long-lasting, robust and reliable value solutions. We specialise in supporting our customers at all points of a products voyage; Pre-purchase technical advice, CAD supported technical solutions, managing classification specification if required, product installation support, then backing all up with a superb after-sales service via our network of approved engine installers and service centres. Our Inland waterway portfolio offers a range of 14 to 98 HP propulsion engines which may be specified with super silent acoustic housings, mechanical or hydraulic gearboxes, optional 3.5 or 5.0kVA travel power in addition to engine start battery & domestic battery charging alternators. Full hydraulic pod drive system, bow thrusters, and hybrid propulsion complete our comprehensive offer which is then supported by a 5-year self-service warranty. So, whether you are in immediate need or planning a future project we look forward to supporting you. Elsan toilet fluid and sachets help ensure safe, trouble free holidays on boats, caravans and motorhomes. Elsan also make products to protect the fresh water system of your boat including Elsil drinking water purifier and Fresh Water Tank Clean to descale and sanitise the system (chlorine free so it’s safe for your water heater). For further information visit www.elsan.co.uk or call 01825 748200. Mercia Marine (Underwriting) Ltd specialise in providing boat insurance, marine business insurance and marine trade insurance. We are fully committed to looking after the interests of our customers first and foremost so if you deal with us via the internet, contact us by telephone, correspond by post or simply just visit us in person, we are dedicated to giving you a high quality service. North Kilworth Wharf is based on the 20 mile lock free summit of the Leicester section, Grand Union Canal. The Wharf has been a working boat yard since the sixties and offers all narrowboat services, including, boat painting, hull blacking, marine engineering, welding & fabrication, moorings, hard standing, storage, boat fitting and repairs. Wharf services include:- calor gas, red diesel, coal & smokeless fuels, pumpout & elsan disposal. We have a shop that offers basic groceries, alcohol and chandlery. We operate a self steer day boat Lazy Days and we are a base for Anglo Welsh Hire Boats Our aim is to be very competitive and work to a very high standard and unlike other boat yards we try very hard to complete work on time. Open seven days a week, 9am till 5pm Monday to Saturday, 10am till 4pm Sundays during summer (closed Sundays from November to end February). Based on the Coventry Canal, between bridge 74 and Glascote Locks. We are centrally located for cruising the Midlands canal System. Our members come from as far afield as Stockport and Dunstable in Bedfordshire. We have non residential moorings available at competitive rates and winter moorings are welcome. Our services include water, electricity, Elsan disposal, clubhouse with bar hosting regular club nights and social events. Please note that access to the club’s site from the road is via an electronic card access gate and thus any visit should be by appointment. See ‘contact us’ page on our website for contact details. Vetus recently celebrated its 50th anniversary and have always been involved in the canal market, as might be expected from a Dutch company. We are best known for the reliable and long lasting Mitsubishi based engines which power so many Narrowboats around the country. This entire engine range was recently redesigned and now has unique features which make them quieter and cooler running than any other compatible engines. Our larger based engines are also extremely popular in wide beams and of course – Dutch barges! In contrast with other engine manufacturers, Vetus also offers thousands of other products to make your boat complete. We specialise in specifying new build boats and rebuild projects and can offer all the mechanical, plumbing and electrical requirements on board. But we are also happy to supply single components and our knowledgeable dealer network is at hand to help you. Our prices are competitive and we can guarantee that Vetus engines and equipment will all fit and work together; something that doesn’t always happen when you buy from different manufacturers. Best of all, our engines come with a 5-year warranty and all other equipment with a 3-year warranty, to guarantee you peace of mind and carefree boating. 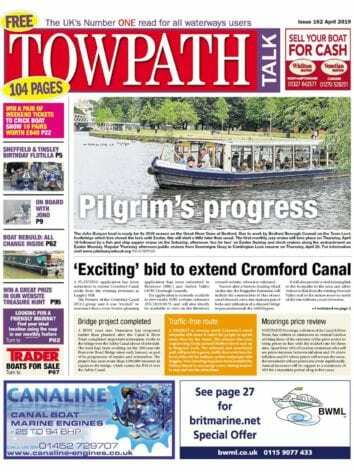 • To get listed contact The Towpath Talk Team on 01507 529455.